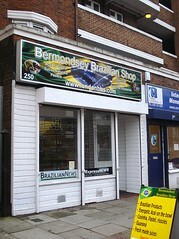 The Bermondsey Brazilian Shop was a small cafe on the Bermondsey/Rotherhithe borders, just a couple of minutes' walk from Bermondsey Station. It has now closed. According to Google Street View, as of August 2014 the premises were occupied by a business called Cantinho da Maya. The information below is retained for historical reasons. Small cafe on the Bermondsey/Rotherhithe borders, just a couple of minutes' walk from Bermondsey Station. It opened in early 2011, replacing an Eastern European grocery shop called Uncle Jonas. Now, it has seating for maybe a dozen people, some at small tables and some on high stools at a counter along one wall. Shelves opposite this counter hold a reasonable selection of Brazilian groceries including cheese bread mix, fruit pastes, palm oil, ground coffee, and various dried beans, lentils, and grains. The weekday cafe offerings are limited to drinks and desserts, but they do have a fairly extensive drinks selection, with Brazilian soft drinks in the fridge, a proper coffee machine, and a separate menu with over a dozen juices/smoothies photo. They also do a small buffet of hot food on Saturdays between noon and 5pm, priced at £1.20 per 100g (as of April 2011). Kake and Sarah tried the buffet in April 2011. Arriving a little before 2pm, we were the only customers. The buffet consisted of four slow cookers, containing plain rice, black beans with pork and sausage, chicken breast in double cream, and fried vegetables (potatoes and carrots). It was all pretty good. Even the chicken wasn't quite as boring as chicken breast usually is, and they hadn't tried to bulk out the cream by using cheaper thickeners. The beans were very tasty, flavoured with belly pork and with a generous proportion of meat to beans. It did work out a little more expensive than we'd anticipated, though — it would be easy for the price to mount up quite high if you weren't careful about how much you were taking. Kake also tried one of the drinks; limonada (£1.80), described on the menu as "lime fruit, mint leaves and water". It was freshly made, nice and cold, not too sweet, and a very generous portion for the price (nearly a pint, and not bulked out with ice either). Sarah had grape Fanta from the fridge, a nice change from normal Fanta. Kake's verdict: I would come back just for the limonada. Probably also for the buffet, though not if I was very hungry. I'm not sure I'd recommend travelling across London for it, but if you're local (and not vegetarian) then it's definitely worth a try. Accessibility: No step to get in, just two small ridges. Not sure if there's a toilet. Last visited by Kake and Sarah, April 2011. Last edited 2015-05-08 21:22:37 (version 6; diff). List all versions. Page last edited 2015-05-08 21:22:37 (version 6).